Ok, it’s far from a comprehensive survey of the city by night, but whaddya want, I only had a single night for night shooting, so I confined myself to where I could walk to from my apartment. One of the great things about where we (my father and I) stayed was the fact we were in walking distance of just about everything, from the subway to all the historical buildings and neighborhoods. 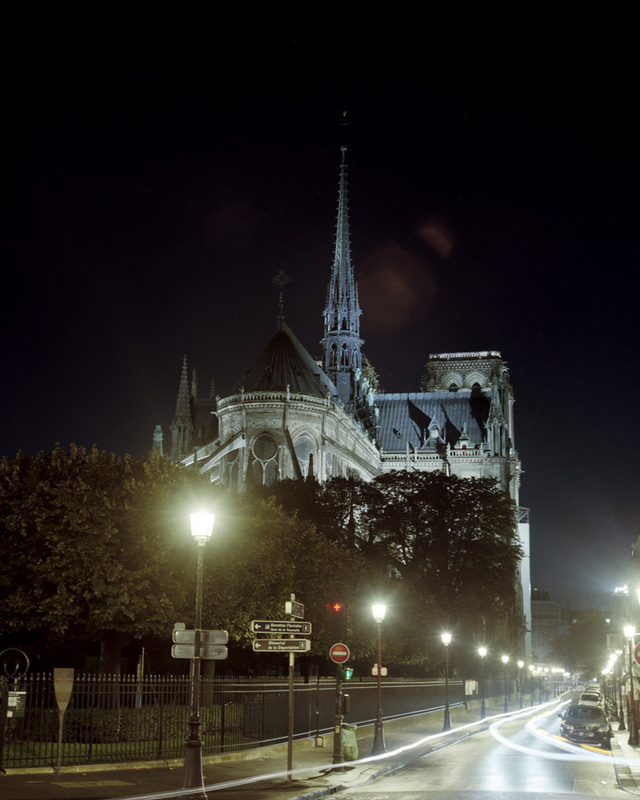 Notre Dame was a stone’s throw away, across the bridge. Here is the rear view from the approach I took over the Pont St. Louis. 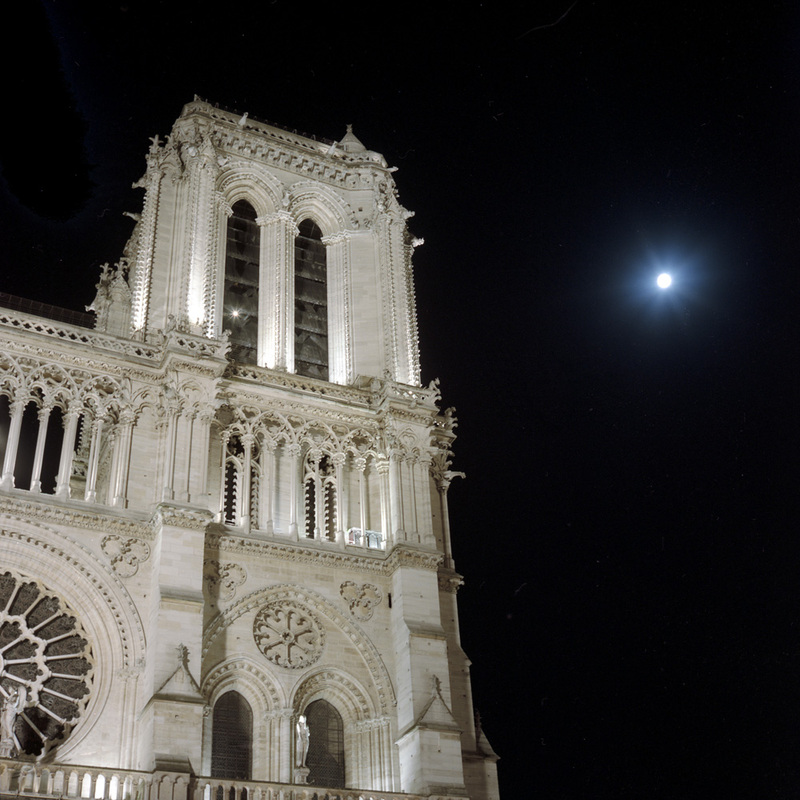 The front facade is fully illuminated at night, and they have built a set of large risers in the plaza in front that if nothing else serve as a great camera platform for photographing the towers. The night I was out shooting was the night of the full moon, so I got lucky and was able to get this shot of the tower and the moon. Another view of the towers, from a side street. It had been raining that evening, so the streets were wet giving them that Hollywood movie look. 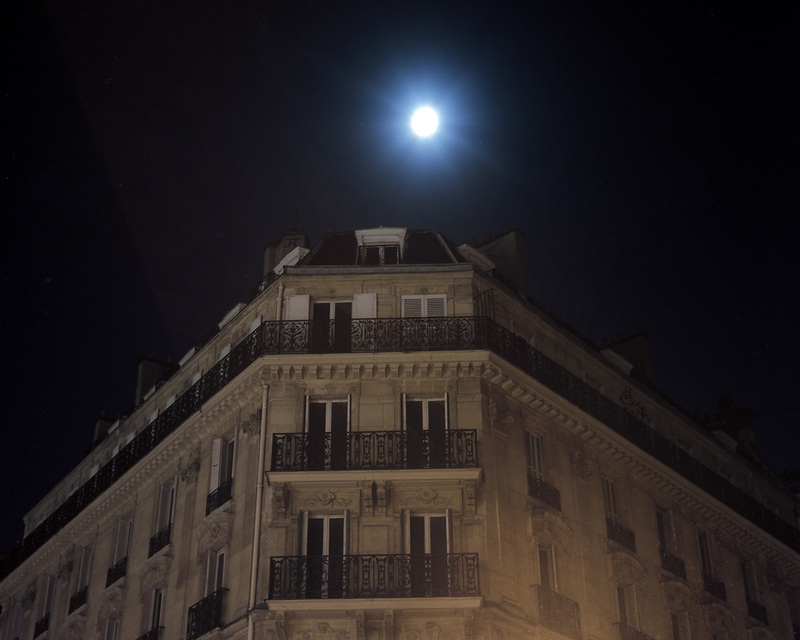 Another shot of the full moon, over a grand Hotel (Hotel in the Parisian sense of grand city residence/townhouse as opposed to place-where-you-rent-a-room-by-the-night) on the Ile de la Cite. The Pont St. Louis, slick with rain. This is the bridge that connects the Ile St. Louis with the Ile de la Cite. A view of the Hotel de Ville (Paris’ City Hall) from across the Seine. The white line at the river level is created by the lights of a passing river tour boat that has flood lights on the roof to illuminate the buildings on the quays as it passes. I don’t envy the people whose apartments face the river because of that, even if the boat tours do stop sometime between 9 and 10 pm. 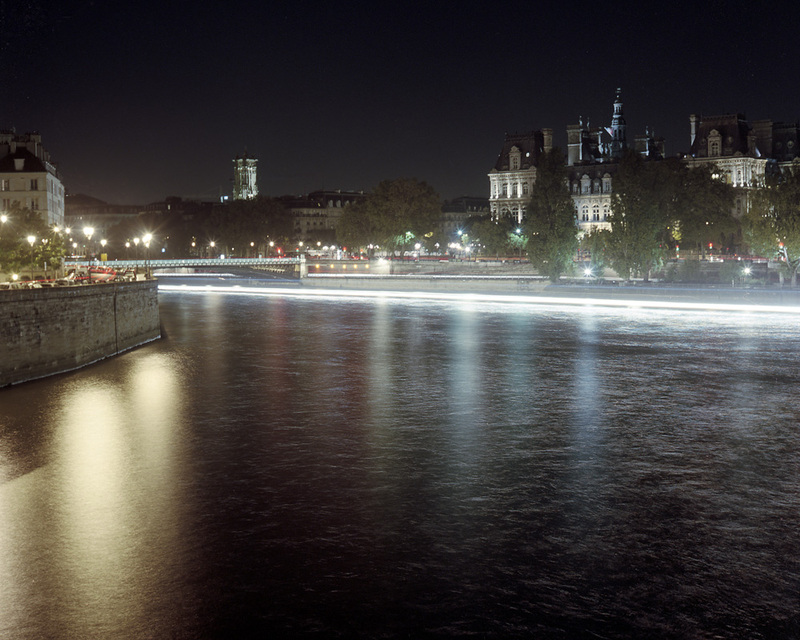 Another view of the bridges across the Seine. In the background on the left you can see a rather castle-like building which is La Monnaie, the old French Mint where they used to make coins. The last bridge of today’s program is the Pont Louis Phillippe, which connects the end of the Ile St. Louis to the north bank of the Seine. The bridge I used every day to get to and from the subway was the Pont Marie, which abuts the middle of the Ile St. Louis. 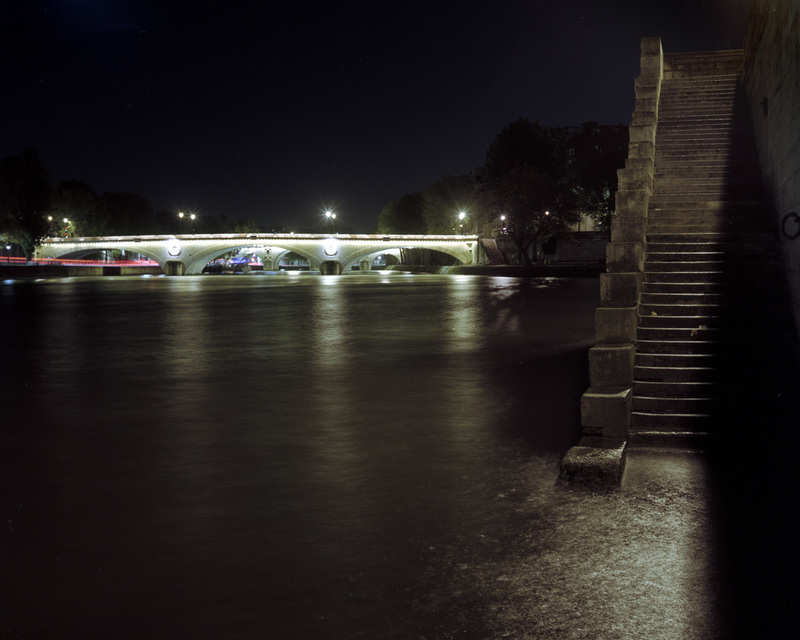 I wanted to get a view of the bridges from water level, so I went down a set of steps on the quayside of the Ile de la Cite and set up my tripod at the very bottom – you can see from the facing set of steps they descend all the way into the water (I did not test how far down they go, as I had no desire to get wet, especially at this time of year). The St. Regis cafe has a view of the Pont St. Louis. Notre Dame itself is hidden by the buildings across the bridge. 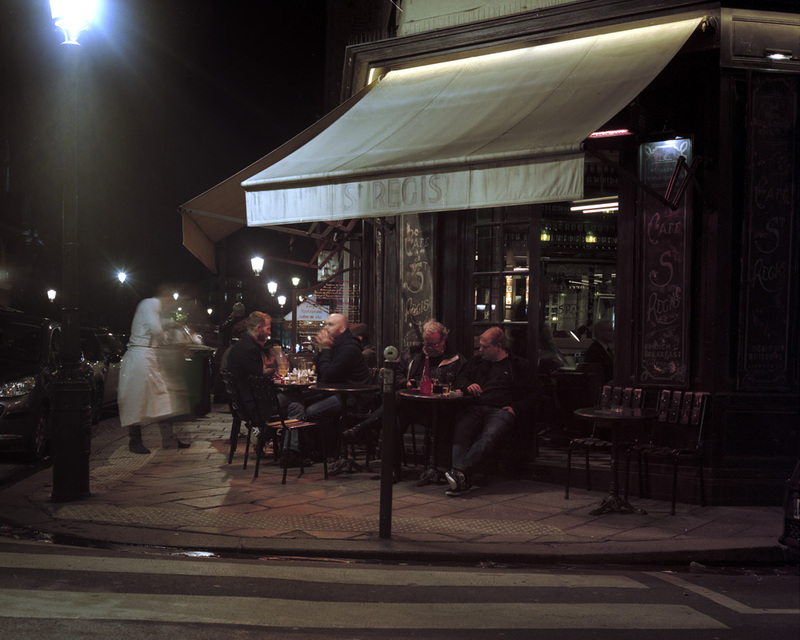 On my excursion, I saw people sitting outside the cafe all evening – I returned home at nearly midnight and there were people still outside the cafe as it was closing up. 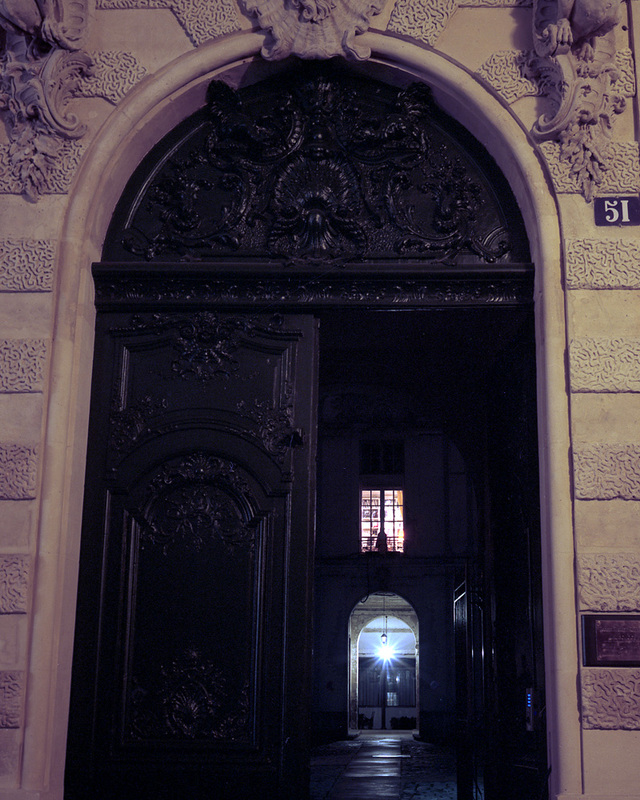 Here’s a look into the courtyard of one of the hotels on the Rue St. Louis en l’Ile, at number 51. I looked through the doorway, which had always been closed when I walked by in the daytime, and saw the light on in the library window on the second floor, and I just had to take that picture. I love libraries (I’m sitting in one as I type this, my modest personal library of 2000 or so books), so seeing in to one had a rather Proustian effect on me. 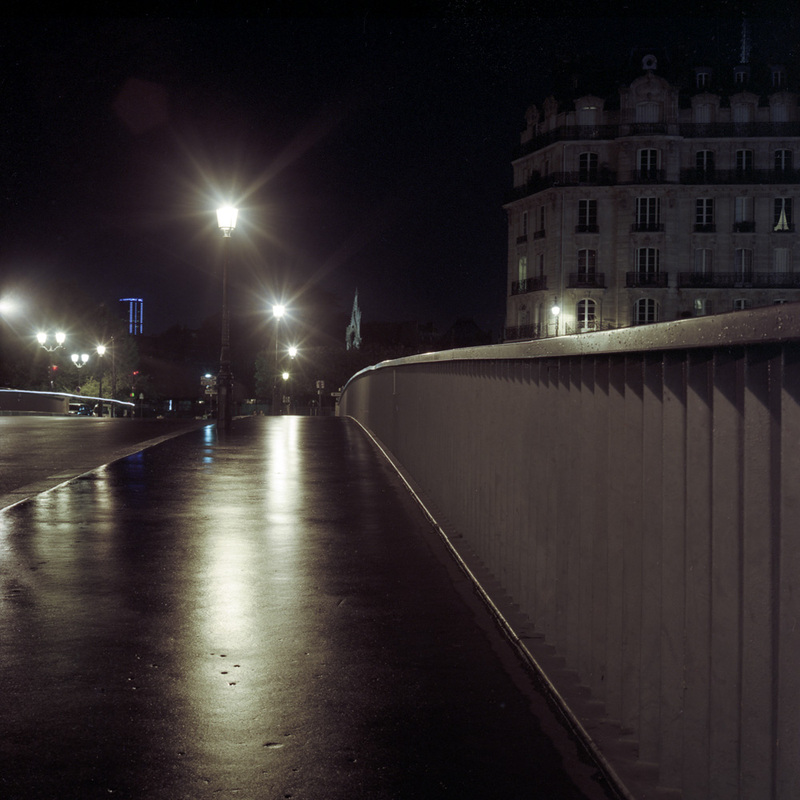 I shot all these on Kodak Portra 160 because I like how it responds to nighttime color better than Ektar. 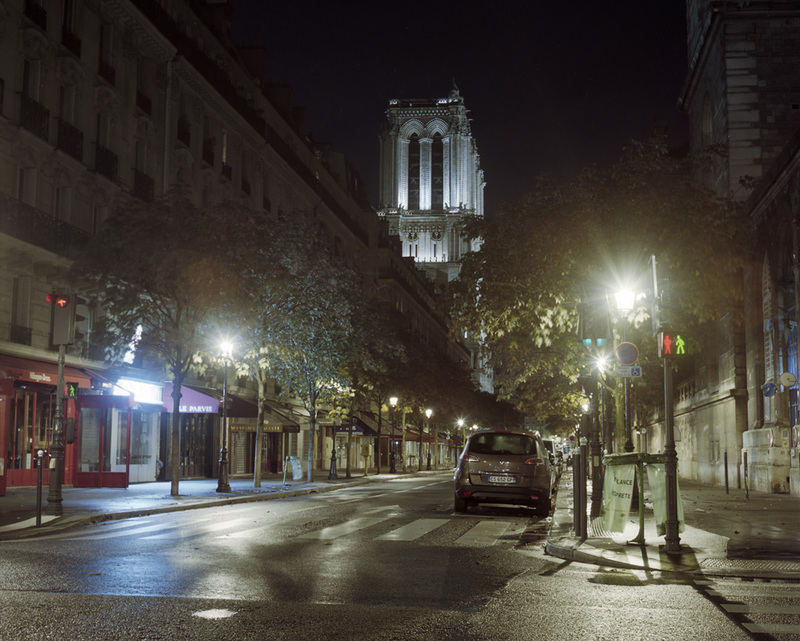 It has a less contrasty look which is good for night because night scenes are inherently contrastier than daytime scenes, and it handles overexposure better than Ektar. 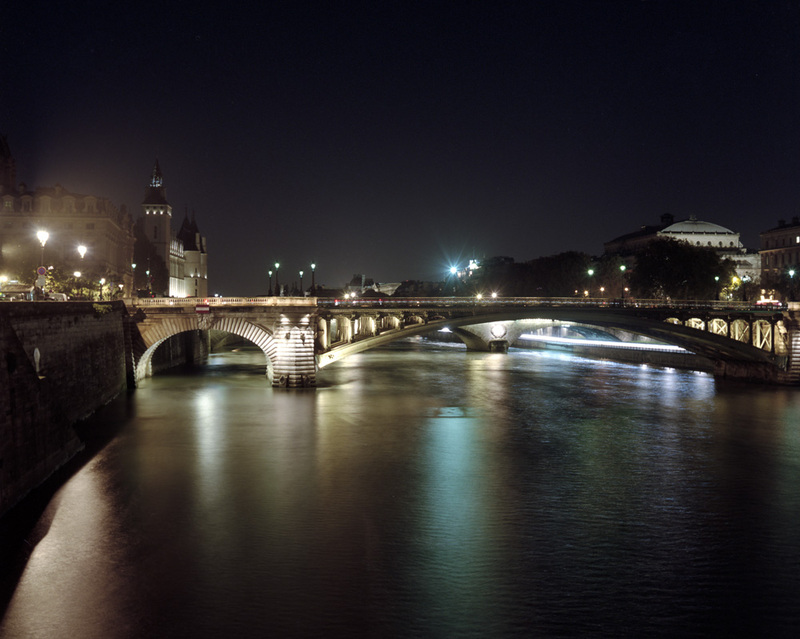 Paris looks wonderful at night and your shots highlight some of the beauty that makes Paris known as the “City of Light (La Ville-Lumière)”.